Everyone loves a storybook ending: the guy gets the girl; the underdog wins the big game; the perfect night ends with an even more perfect dessert. While other courses provide nourishment, desserts provide pure pleasure. Devoted to the whimsical aspects of the culinary world, flavors are limited only by imaginations often exceed what one might think is possible. Where most people see cocoa powder, butter and vanilla bean, pastry chefs see boundless possibilities: a universe about to unfold or a myth waiting to be told in the language of spun sugar, whipped cream and rich chocolate. Some of the world's best pastry Chefs are in Las Vegas. Feast your eyes on the confectionary genius of five of the finest Las Vegas chefs ever. Celebrate the escitement of the season with the Spring Bouquet Cake created by Chef Jean-Philippe Maury and his team. Delicate flowers and fondant icing adorn vanilla sponge cake with Grand Marnier cream and assorted fresh berries. 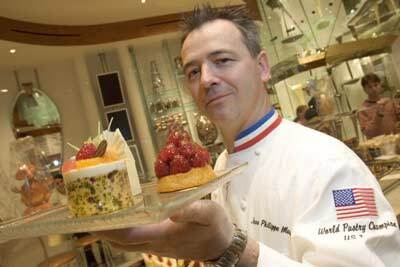 Chef Jean-Philippe Maury has turned his passion for pastry into a decorated career: he has won numerous accolades and awards, including Best Pastry Chef in France and gold medals at the World Pastry Team Championship. Stop by the opulent Jean-Philippe Maury Pâtisserie at Bellagio Las Vegas for a taste. Chef Vincent Pilon's Wildfire balances bold red and dark chocolate with the delicate, curved shape of the butterfly. French macaroons topped with caramelized apple, subtle lemon raspberry and fresh fruit accent the piece. 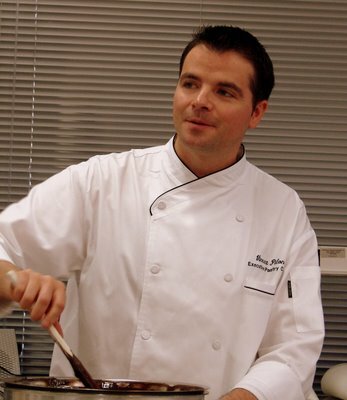 Chef Vincent Pilon is the recipient of gold medals at the 2003 National Pastry Team Championships, 2005 Food Network Chocolate Challenge and Food Network Chocolate Runway. Also 2007 National Taste Award and 2007 Chocolate Master's Championship. Pastry Art & Design also named him one of the Best Pastry Chefs in America. This Fresh Berry Galette from Chef Debra Mitchell relies on a perfect blend of simple ingredients. Based on a thin, buttery, crunchy cornmeal crust, the sweet cream cheese filling, flavored with fresh orange zest and vanilla bean, is accented with seasonal berries and berry puree. Chef Debra Mitchell, co-author of The Diabetes Holiday Cookbook, is winner of several medals in culinary competitions including "Best of Shows" in the Las Vegas Culinary Salons. Light and sweet island flavors infuse the rich Tofu Cheescake from Chef Carlos Salazar. Coconut gelato, passion fruit, pineapple comfit and a coconut milk reduction steep the dessert with a tropical taste. The Colombian-born Carlos Salazar has been featured in Food Arts, Chocolatier and Pastry Art and Design magazines and is the recipient of numerous medals including a silver medal in the World Pastry Team Championship.